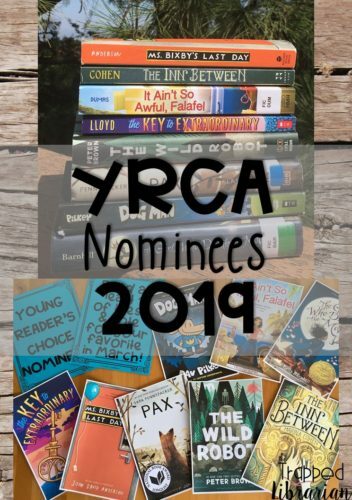 Each year I promote the nominated books for the Pacific Northwest Library Association’s Young Reader’s Choice Award in my 4th and 5th grade classes. My students are eligible to vote for their favorite book in the Junior Division, which covers grades 4-6. 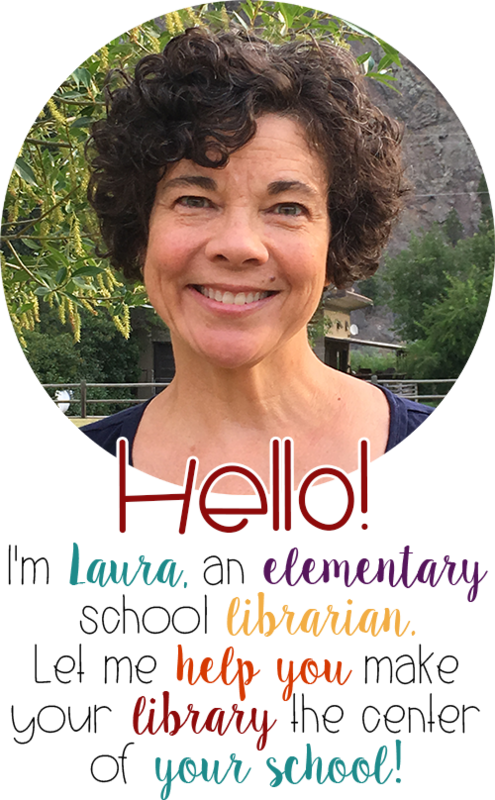 I use book trailers and a library catalog review activity in my library classes to get the kids familiar with the books and hopefully entice them to read a couple of them. This post contains affiliate links. If you click through and make a purchase, I may receive a small commission at no additional cost to you. As I read each of the nominated titles, I review them on my Instagram account. I’m including my reviews here so you can conveniently read them in one place. I am not finished reading all of the nominated titles yet, but I will add each review as I complete it. For more information on the activities I use with my students, see my Destiny + YRCA resource in my Teachers Pay Teachers store. Quinn is on a road trip with her best friend Kara when the family stops for a night at a peculiar hotel in the middle of now here. Strange things begin happening when Kara’s parents and her brother go missing. Flashback scenes help to piece together a sad past for Quinn. When the girls finally escape from the hotel, readers will have an “Aha!” moment as the details fall into place. 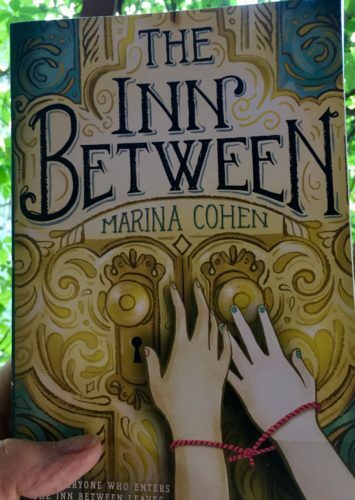 This middle grade novel will be a hit with readers who like scary and suspenseful stories! The characters are relatable and the suspense keeps the pages turning. 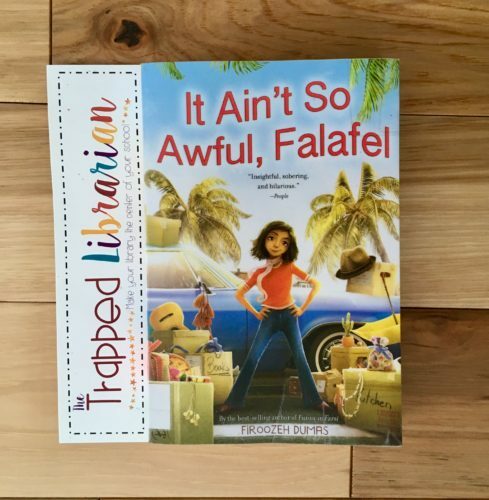 Recommended for elementary library collections! I fell in love with Emma Pearl Casey from the very first page. I could tell that she is a person who has overcome some hardship and looks at the bright side of life. She is a good friend, granddaughter, sister, and daughter. Emma is seeking her destiny, and believes it is to find a key to unlock a treasure to help save her family’s café. 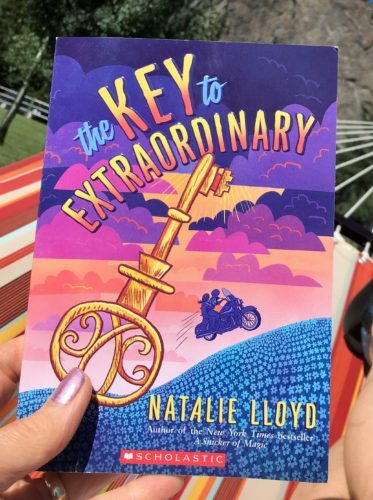 This book has a great mix of adventure and suspense and a little bit of spookiness – they live right by a graveyard and their café is called The Boneyard Café! Themes of friendship, perseverance, and optimism make this a great read! 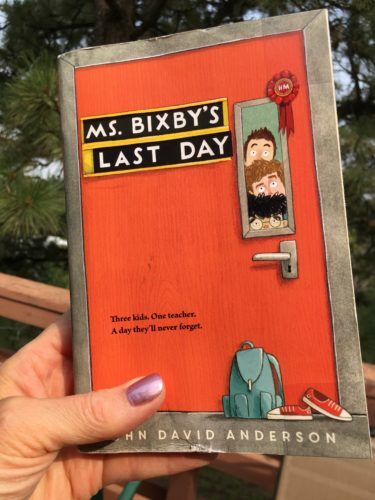 When a favorite teacher has to miss the end of the school year to undergo cancer treatment, 3 of her sixth grade boys plan to break her out of the hospital for one last special day together. This book has just the right mix of heartbreaking reality and laugh out loud fun. Although the action takes place in one day, the author does a brilliant job of taking us back for meaningful snippets to give a clear picture of the friendship between these boys and how important their teacher is to them. Action packed with attention grabbers like skipping school, a shark toilet and a tattooed robber, readers will alternately laugh, be on the edge of their seats, and contemplate the deeper themes of friendship, individuality, hardship, and perseverance as the story is told from the point of view of each of the boys. I wholeheartedly recommend this as an addition to all elementary and middle school library and classroom collections. It would be an excellent read aloud! And all of you educators out there who work with kids this age, read this book for a reminder of why you chose this profession and the difference you are making in your students’ lives! Peter’s dad is going to war and he’s going to stay with his grandpa. His dad forces him to let his pet fox, Pax, out in the wild so that his grandpa doesn’t have to deal with him. Peter has already had so much loss in his life after losing his mother, and saying goodbye to Pax is too much. He decides to run away in the middle of the night to find Pax and this is where the adventure begins. 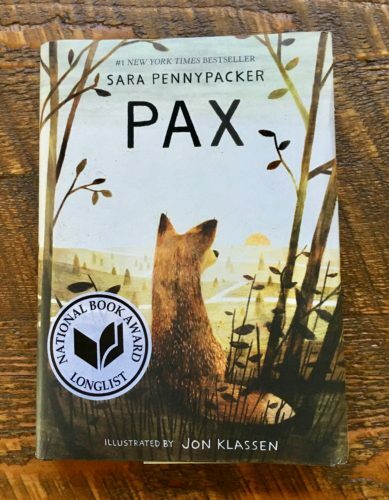 Readers who like animal stories are sure to love this book, which alternates between the points of view of Peter and Pax. Personally, I was caught up in wondering about the setting (both time and place), since it seemed like it was in America in modern times, yet the war was happening close by. I don’t think that young readers will be bothered by this as I was. I believe the author wanted us to believe that this could happen where we live, and she definitely achieved that! Contrasts in the relationships in Peter’s life pit the coldness of his father and grandfather against the warm loving memories of his mother and Pax. When Peter meets Vola, a gruff disable veteran woman, he eventually gains his independence and the courage to face his family again. Plenty of suspense, hardship, and adventure will keep the pages turning! What if a robot is stranded on an island? Could she learn to survive in the harsh wilderness and get along with the wildlife there? Kids will love to consider those questions and read the story of Roz, the robot who has many adventures in the wild. As readers enjoy this wild adventure, they will also ponder themes of friendship, honesty, hard work, community, and humanity. 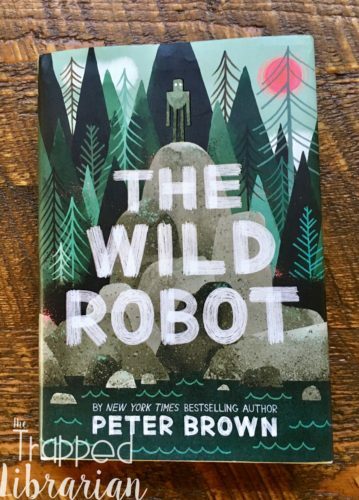 Peter Brown masterfully weaves it all together in an exciting tale that is sure to grab middle grade readers and have them begging for the sequel! Zomorod is trying to fit in at her new school in Newport Beach, California in the late 1970s. So she changes her name to Cindy and tries desperately not to draw attention to the fact that she and her family are from Iran. This becomes nearly impossible as the hostage crisis is constantly in the news. She wants her friends, neighbors, and classmates to know that there are many regular people in Iran who are hurting from the effects of this terrible event as well. Motivate Your Students to Read and Practice Library Catalog Search Skills at the Same Time! 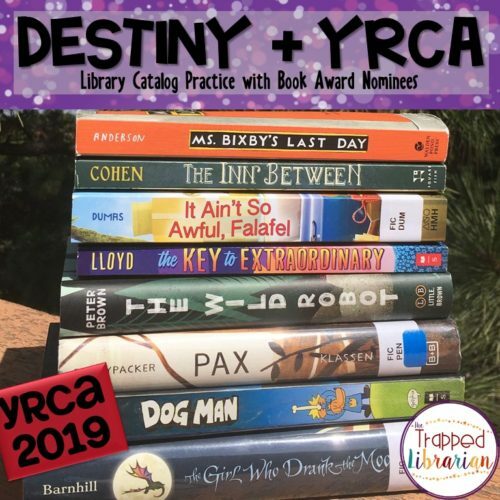 My Destiny + YRCA unit mixes library catalog search skills with book trailers for some great practice and some time to make a reading plan Check it out in my TpT store! 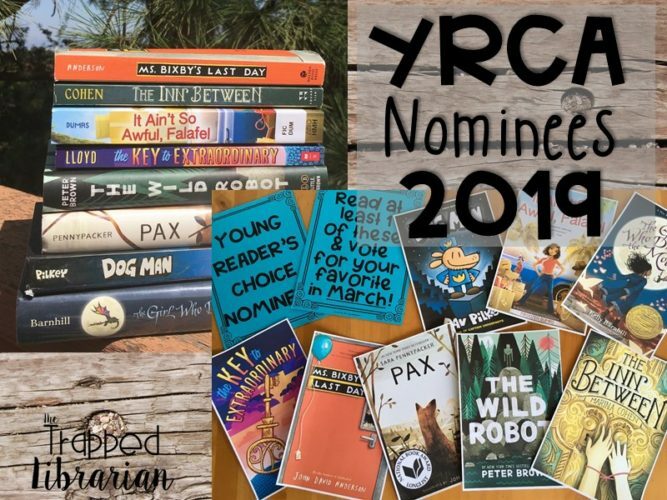 Do your students read the Young Reader’s Choice Award books? If you have a great idea for promoting them in your library or classroom, please share it here! Teach in a Tipi for an Engaging Learning Experience!